When it comes to cardio, I’m one of those people who like to get it done as fast as possible. Jogging long-distance or spending thirty minutes on an elliptical isn’t my thing. That’s why I love high intensity interval training (HIIT). 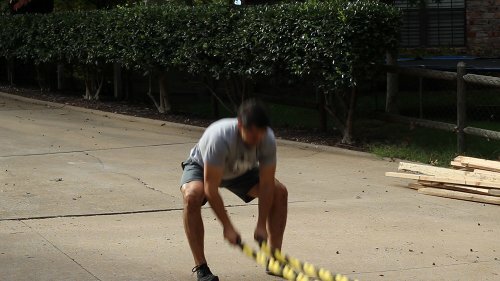 The basic idea of HIIT is to alternate between periods of short, intense anaerobic exercise (like sprinting, kettlebell swings, or burpees) with less intense resting periods. You repeat this sequence of short, intense exercise and resting for as little as four minutes or as long as thirty minutes. Research has shown that HIIT improves both aerobic and anaerobic conditioning, boosts testosterone levels, and ramps up your metabolism and keeps it ramped up hours after you’ve finished exercising. 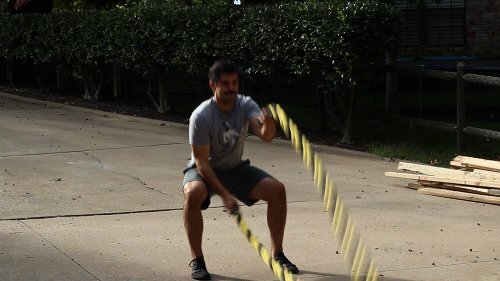 I’m always on the lookout for new HIIT routines, and I’ve recently discovered one that has become my new favorite: battle ropes. That’s a perfect way to describe it. 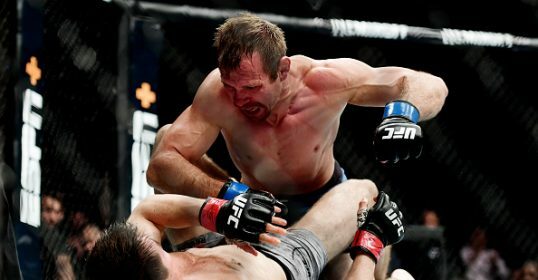 In just twenty seconds of intense battle-roping, your heart rate will reach its peak and your arms will feel like battery acid is coursing through them. In short, you’ll feel great. 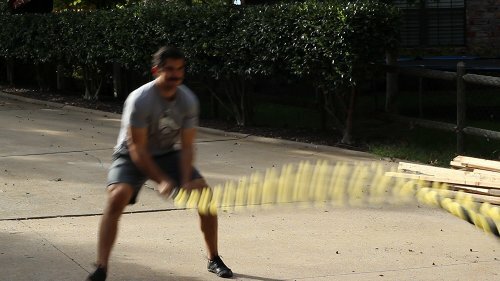 I don’t know what it is, but battle rope exercises are incredibly satisfying. 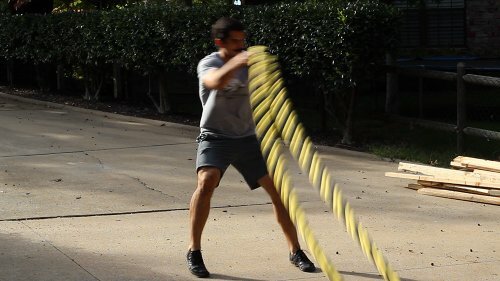 And effective: the intense anaerobic and aerobic conditioning that battle rope exercises provide has made them a staple in the training of professional athletes and mixed martial artists. 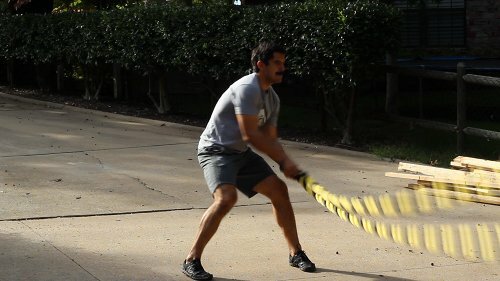 There’s not much to battle rope exercises. 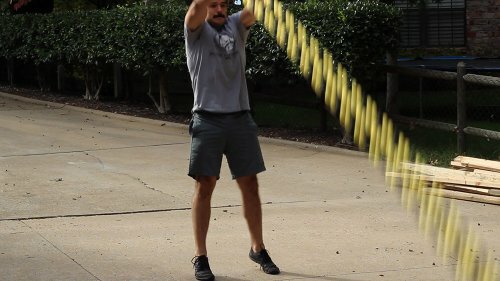 You just hold a thick, long rope by the ends and move your arms up and down or in circles as fast as you can. In essence, you’re “battling” the ropes. 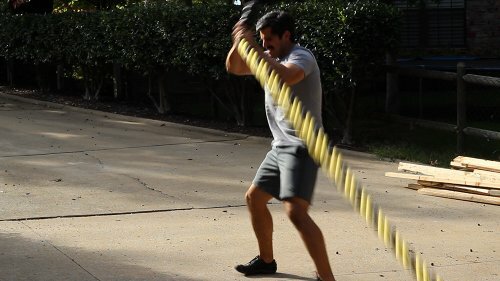 Today, I’m going to give you the lowdown on 15 different battle rope exercises you can do, along with a suggested workout. 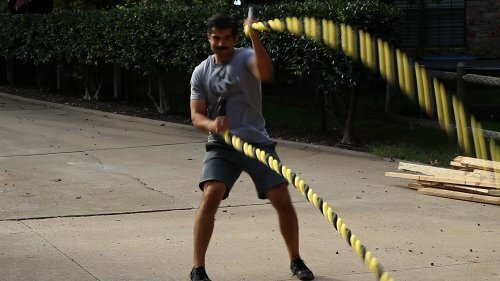 Because of the increasing popularity of battle ropes, you can easily find them online with a quick Google or Amazon search. 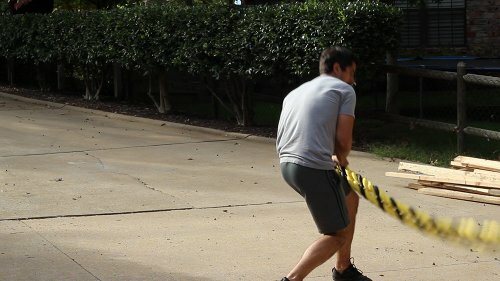 The battle rope I use is from Onnit. 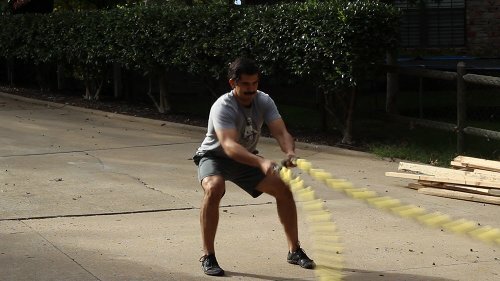 The longer and thicker your rope is, the harder it is to battle. 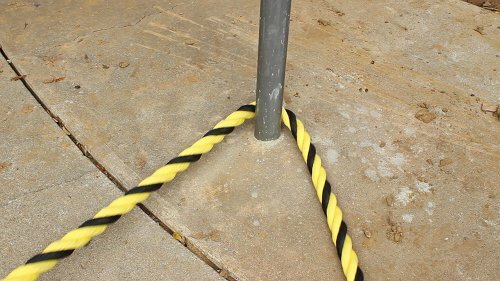 Go for a rope that’s around 2 inches thick and 50 feet long. That will give you a nicely challenging workout. 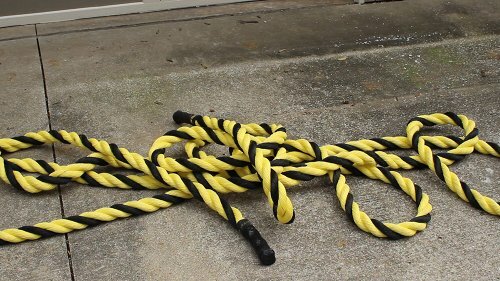 2″ x 50′ rope will run you around $125-$150, which isn’t cheap. Fitness companies will sometimes boost the price of something you can get at a hardware store (minus that fancy packaging/marketing), so I looked around for cheaper alternatives. But even basic manila rope of that size from contractor websites costs the same. If you know a source of cheaper rope, let us know in the comments. 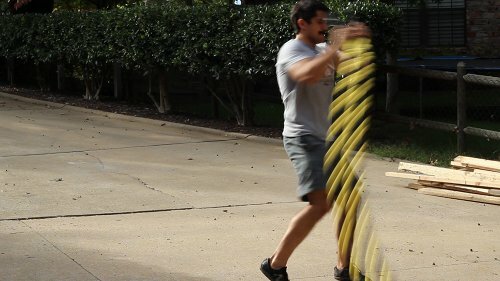 I used my basketball goal post as an anchor for my battle rope. Once you have your rope, you’ll need to find an anchor to wrap it around. Basketball goal posts, fence posts, and trees all work. 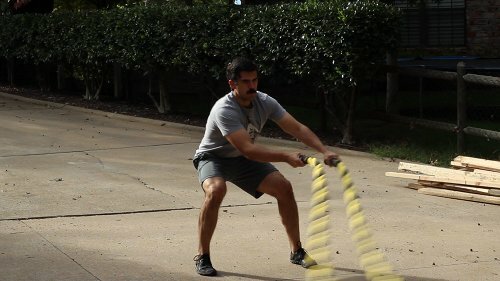 You can even thread your rope through the handle of a heavy kettlebell and use that as an anchor. 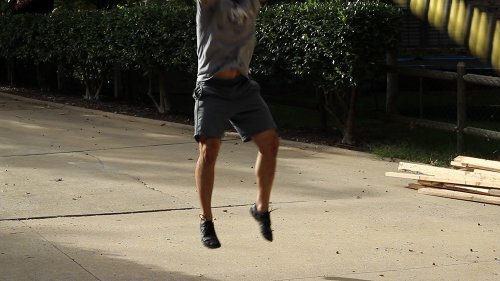 20 seconds all-out, high-intensity exercise. Don’t stop until the buzzer goes off. The whole routine will only take you 10 minutes. I use a HIIT Timer app on my smartphone to mark off my time and rest periods. You could also use something like Gym Boss. Alternate moving your arms up and down as fast as you can. Instead of alternating your arms up and down, move them up and down together. Lift both arms as high as you can and then slam the ropes down to the ground as hard as you can. Go as fast as possible. Same thing as the double arm slam, except when you lift your arms up as high as you can, you also jump. 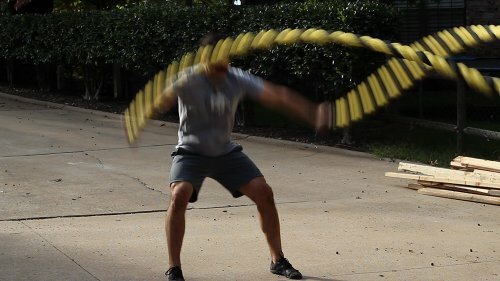 Swing your arms together side-to-side and make your rope slither like a snake. Move your arms in and out like you’re clapping your hands together. 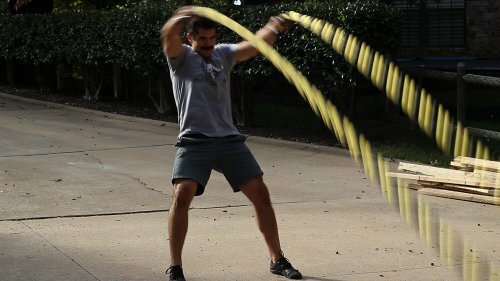 Make big circles with your arms. Your right arm circles clockwise and your left arm circles counter-clockwise. Turn your body to the right with your feet perpendicular to your anchor. 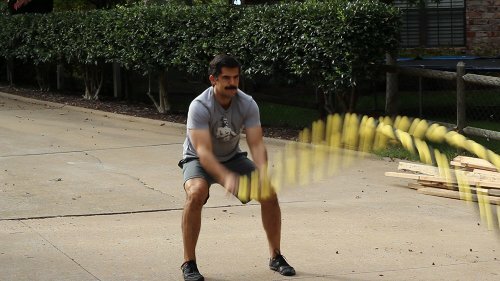 Hold the battle rope ends together in your hands as if you were gripping a baseball bat — right hand on top of the left. Raise your arms up and down as fast as you can. Midway through the round, switch your stance and face the left, and reverse your grip so that your left hand is on top of your right hand. 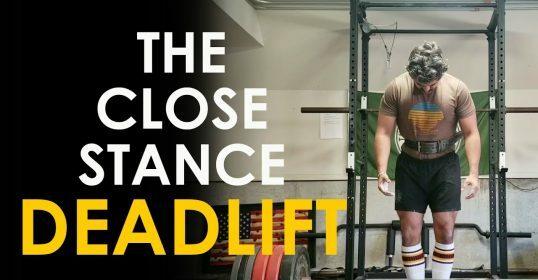 Continue lifting your arms up and down as fast as you can. 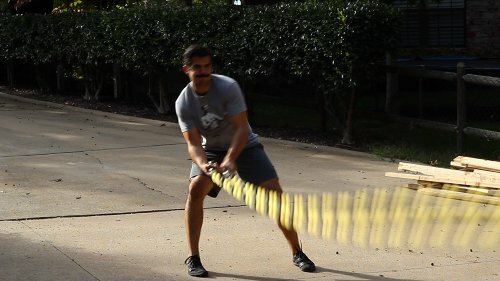 This is a fun battle rope exercise. It mimics the movement a grappler makes when they toss someone over their hip. 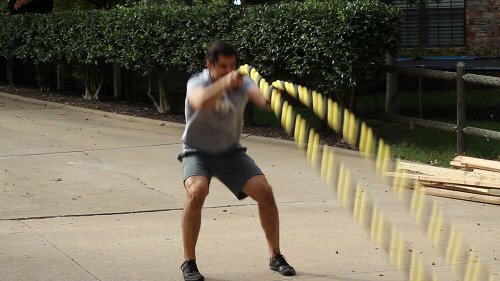 Grab the rope so the ends are sticking out from between your thumb and index fingers and hold the ends down by your right hip. Pivot your torso to the left. 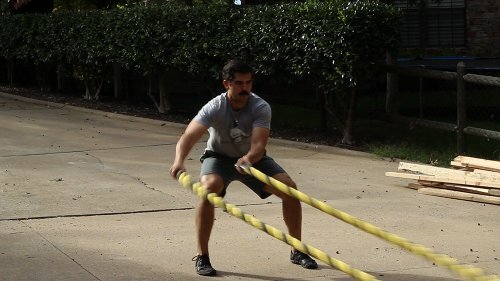 During the pivot, flip the ropes over your hip as if you were throwing a grappling opponent to the ground. Pivot back and forth like this until time is up. 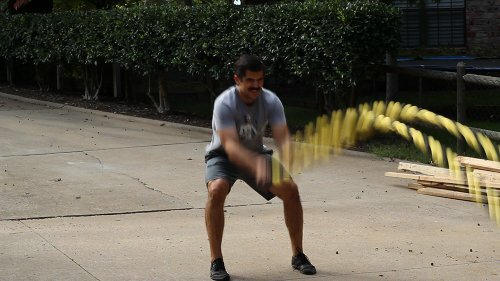 Just your basic alternating arm wave movement with air squats thrown in the mix. 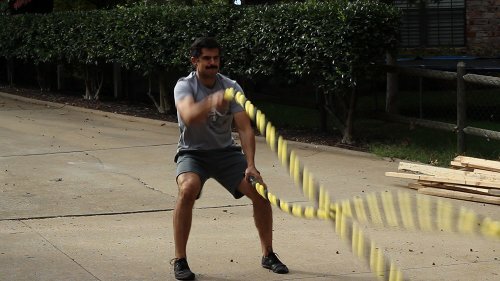 This exercise combines my two favorite high-intensity cardio movements. 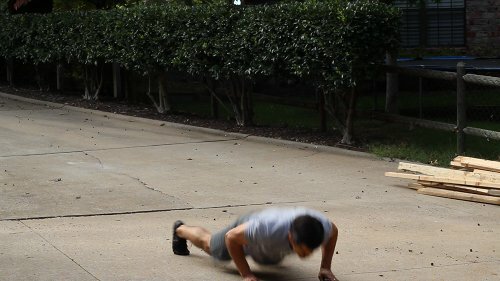 Perform five double arm waves and then perform a burpee. Repeat the 5+1 sequence until your time is up. 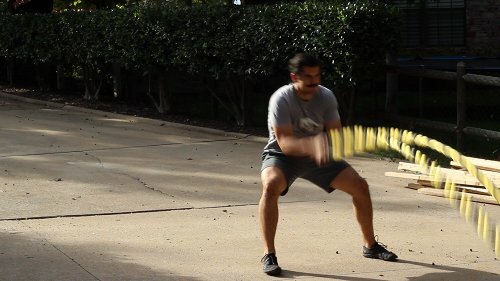 Perform a double arm wave while shuffling side to side. 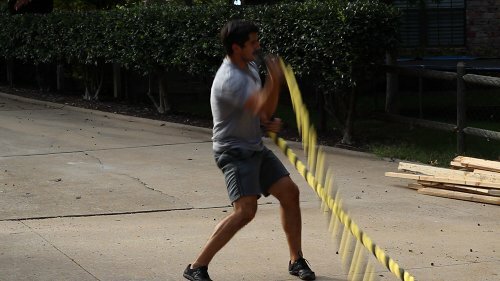 Harness your inner Rocky with a series of alternating uppercuts while holding the ropes. 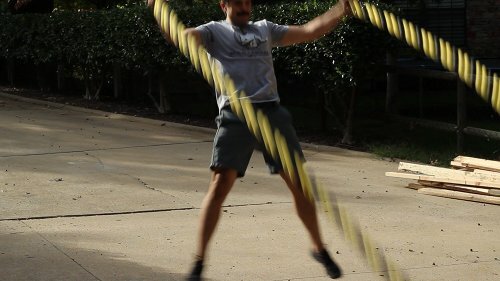 Make a figure eight shape in the air while holding the ropes. Feel free to reverse direction in the middle of your round. 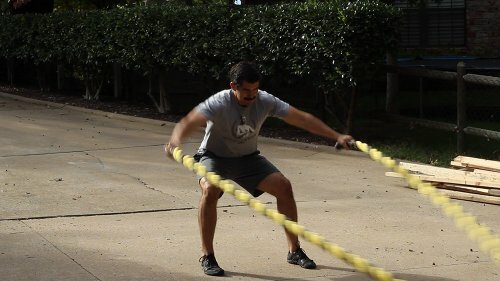 Just hold the ropes by the end and perform some old-school jumping jacks. 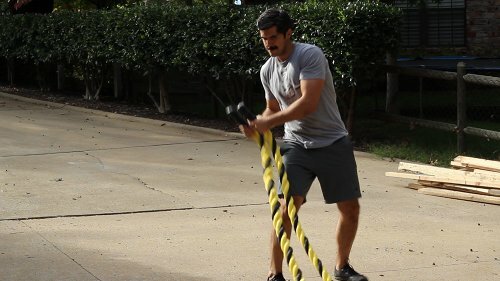 Have you tried battle ropes before? 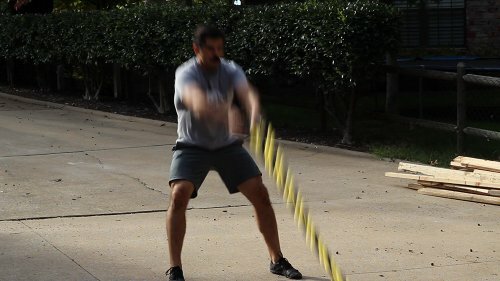 Have any favorite exercises we didn’t include here? Share them with us in the comments!